GDPR – the General Data Protection Regulation is an issue which at least over the last half year started to be very important in Romania and across Europe. But have you ever thought what exactly does it mean, how does it affect you as a citizen or your enterprise? Until now it is likely you already scanned your company activity in terms of Data Protection and implemented some rules in accordance with GDPR, but have you also considered common practice like using apps? After the big security breach that Facebook, who in 2014 bought WhatsApp for $19 Billion, has suffered we had a look to this latter app from the GDPR point of view. Consent: if the controller is processing personal data based on data subjects’ consent, they can withdraw it anytime. In respect to such rights, WhatsApp’s GDPR compliance is questionable on several counts, including the Right to Access, the Right to be Forgotten and Data Portability. transfers users (meaning the eventual customers of your enterprise) data to the USA; This is in conflict with the obligation required by the GDPR to transfer or store personal data outside the EU provided that specific conditions are met. In this context, it should be noted the USA weaker privacy laws which results that an adequate protection of customer data cannot be ensured. collects meta data of users and related personal data, even though the messages are said to be end-to-end encrypted, thus generating personal user profiles and understanding social relationships without being transparent what meta data WhatsApp collects, how it is processed and who it is transferred to and therefore GDPR compliant. Bearing all this information in mind, some enterprises had already banned WhatsApp among their employees, while others had implemented professional and secure enterprise messaging app. In the light of the above, you may consider either giving up on WhatsApp, or deploying an enterprise messaging app. 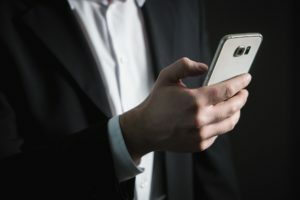 For the first choice, you should pay attention to the fact that a WhatsApp ban must be technically and organizationally feasible, meaning it is not sufficient to ban WhatsApp if employees do not apply such rule. However, there are some options to reduce the risk of GDPR non-compliance, such as separating business and personal contacts that mobile operating systems provide. Though, this solution is not 100% secure. In conclusion, it is clear that WhatsApp does not meet the data protection requirements of the GDPR and an enterprise is non-compliant, if it uses WhatsApp for business purposes. Therefore, we suggest you that at least analyze how your employees use WhatsApp for business purposes so that to reduce the risk of GDPR non-compliance, or to deploy a professional and secure enterprise messaging app, that ensures maximum data protection and fully complies with the GDPR. If you are considering to ban the WhatsApp and/or are looking for deploying a GDPR-compliant enterprise messaging app, we can assist you in implementing such measures in accordance with GDPR.